Ahoy Matey! Is a pirate's life for you? Enjoy dining at the Galley Grub buffet, stopping by Blackbeard's Grog for some tropical fruit punch while the kids play in the inflatable 5-in-1 pirate adventure combo. 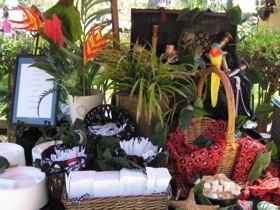 Every detail of your Pirate Adventure has been carefully coordinated, from the color of the linens and umbrellas or canopies to the flowers, pirate props and staff uniforms. Themed prizes are even given away. 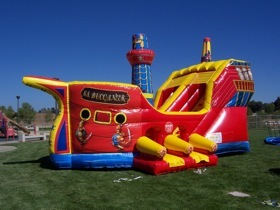 Complement your Pirate Adventure with the Pirate's Cove Obstacle Course or the Tiki Climbing Mountain. 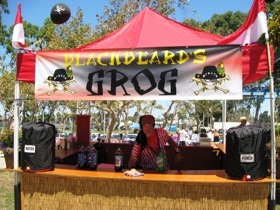 Add the Pirate photo board for great souvenir photos. "Everything was wonderful. The food was delicious; the drinks were plentiful; the games were exciting and enjoyed by all."